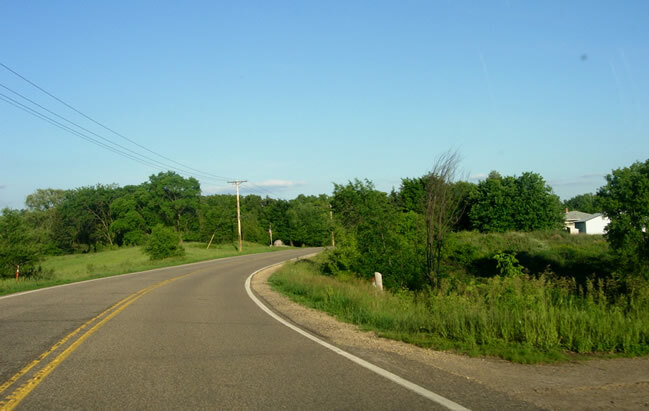 A diagonal link across northern Dakota County was authorized in 1933 as part of legislative route 116, one of the many new routes added in a massive expansion and reorganization of Minnesota's trunk highway system. Essentially, LR 116 was to provide the city of Minneapolis with links to Rochester and Hastings via the Mendota Bridge. 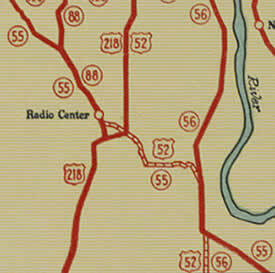 However, when it came time to add the new route to the system in 1934, there was not yet a direct connection between the Mendota Bridge and Pine Bend. 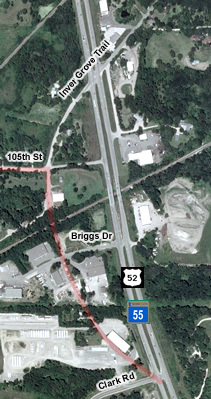 Until that link could be constructed, the Department of Highways took over a temporary route on Rich Valley Boulevard, 105th Street, and the southern end of Inver Grove Trail (see map below). Most of the temporary route had previously been maintained as a county road. The construction project log shows that the county had last graded and graveled Rich Valley Blvd and 105th St in 1923. 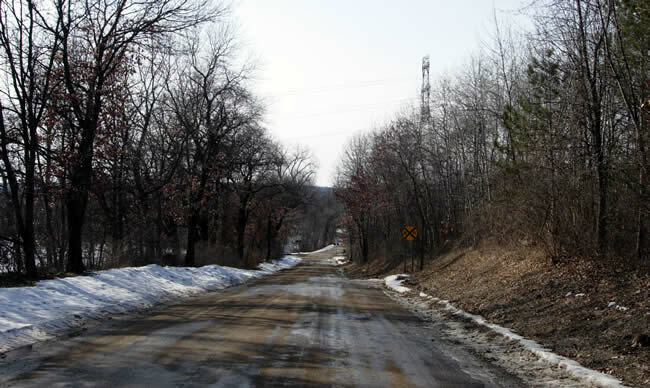 The section of Inver Grove Trail at the south end of the temporary route had been graded in 1921. It had previously been used as the original alignment of State Highway 53 until it was bypassed by a more modern grade in 1931. 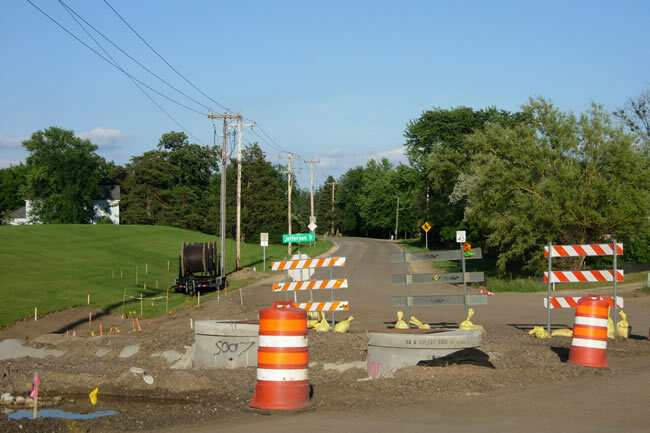 The temporary route was first marked on May 4, 1934 as State Highway 55 and as US 52 east of South Robert Trail (US 52 used South Robert as its link to downtown St. Paul). 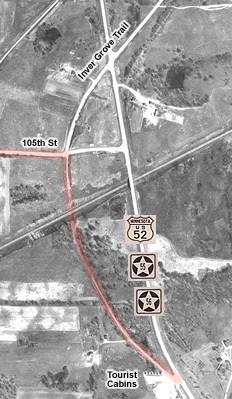 To reach the road to the Mendota Bridge, State Highway 55 temporarily duplexed with State Highway 88 (now Highway 149, old Highway 1/US 65) north from the west end of Rich Valley Boulevard to what is now the the north junction of Highways 55 and 149 (see a scan from the 1934 official highway map, right). 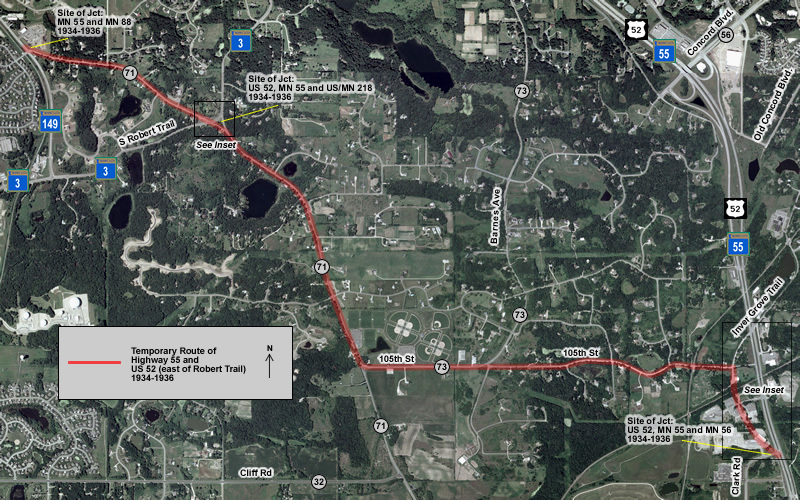 The temporary route was used for only two short years. In 1936 Courthouse Boulevard's grade was completed about two miles to the north, providing the much needed direct link. 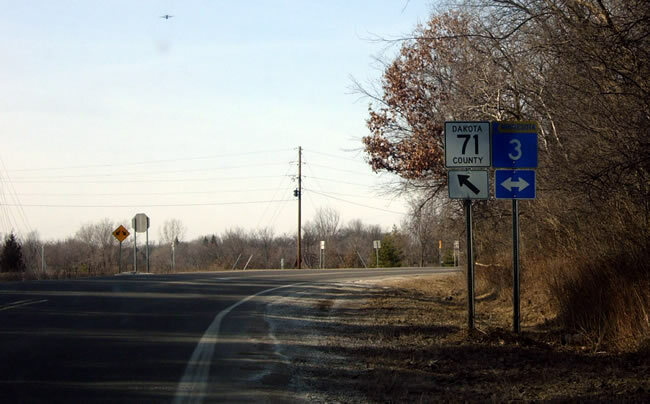 Today, Rich Valley Boulevard is marked as County Road 71, while the section of 105th Street west of Barnes Avenue is part of County Road 73. Both of the county road sections have long since been reconstructed and paved. 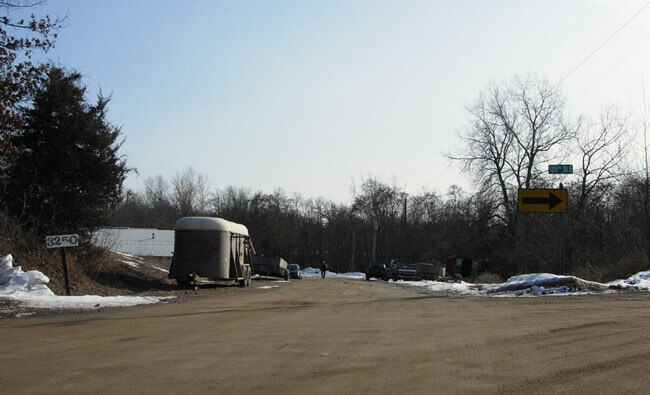 The eastern part of 105th Street has remained relatively unchanged, and is still gravel after all these years. 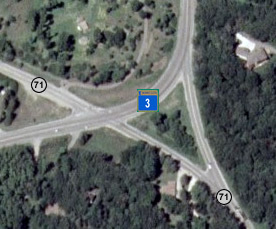 A highlight on the old alignment is the the modern junction of County Road 71 with State Highway 3, which was the original north junction of US 52 and Highway 55, as well as the junction with Highway 218, the predecessor of Highway 3 (see aerial photo, right). It has remained virtually unchanged for over sixty years. 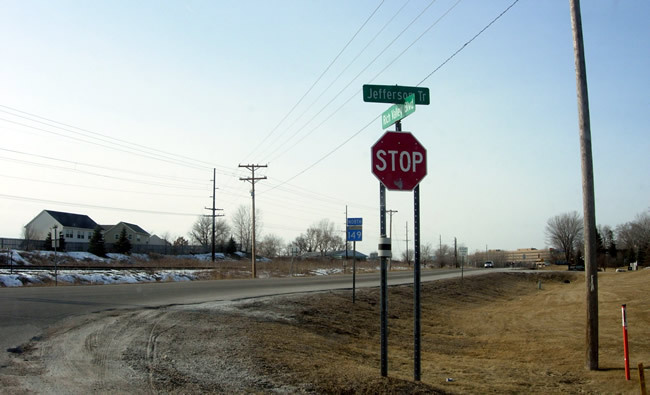 Crossing Highway 3 on County Road 71 can be a harrowing experience due to the junction's outmoded design. The separate two-way connections to Highway 3 on the east side of the junction can be confusing, and the hard curves on Highway 3 make oncoming traffic difficult to see. 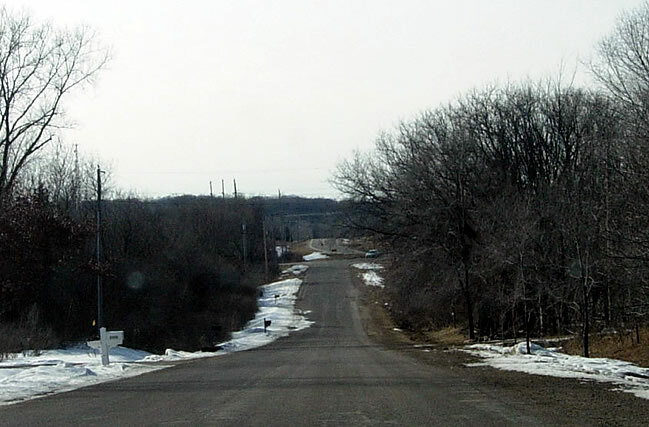 The old south connection to the modern highway, once part of Inver Grove Trail, was closed years ago. The bridge over the railroad tracks was removed before 1947 (see aerial photo from 1947, below left). Its rough outline is still visible in modern aerial photographs (below right). A small industrial park now occupies most of the area around the old alignment. 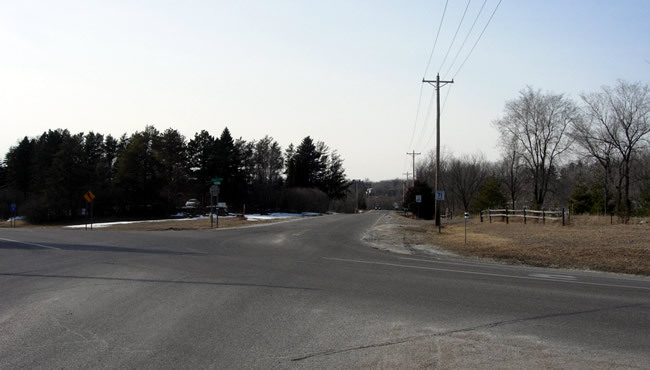 The surviving piece of Inver Grove Trail north of 105th Street may have been used as a connection between southbound Highway 56 (now County Road 56) and westbound US 52/MN 55. The following photos were taken in February of 2006. Photos are ordered generally from east to west. Looking south on Inver Grove Trail at the intersection with 105th Street. Ahead is the remains of the old south connection to the modern highway, now a dead end. The bridge over the railroad tracks ahead is long gone. 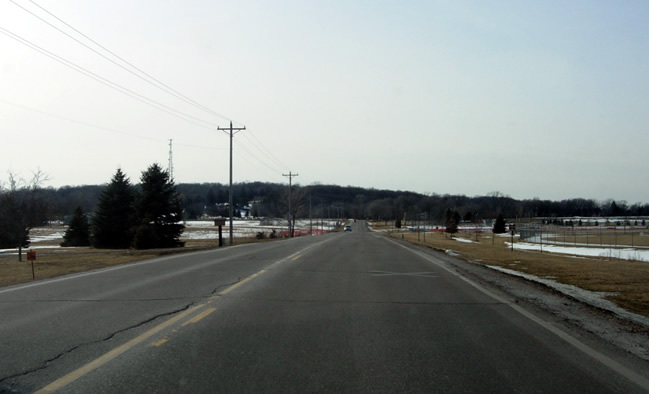 Looking west on 105th Street from Inver Grove Trail. Note the at-grade rail crossing ahead. This stretch is still gravel. Looking west on 105th towards the junction with Barnes Avenue, which now merges directly onto 105th (note how the road curves ahead at the intersection). 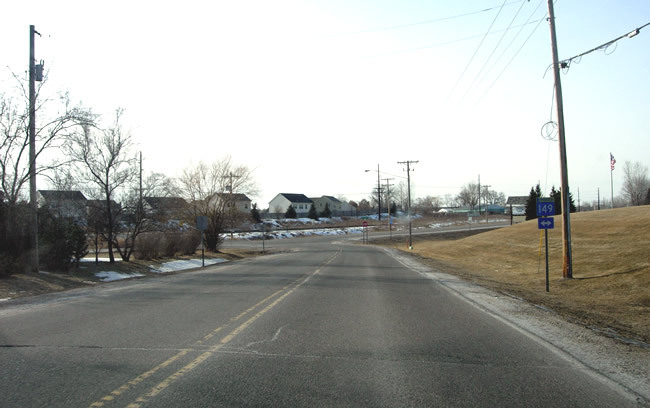 Driving west on 105th Street, now part of County Road 73. Inver Grove Heights has built a large athletic complex and park to the north. Approaching the junction with County Road 71 (Rich Valley Blvd). At the junction with Rich Valley Blvd. The road originally curved to the right through the dirt lot on the right side of the photo. Looking back to the east at the same intersection. 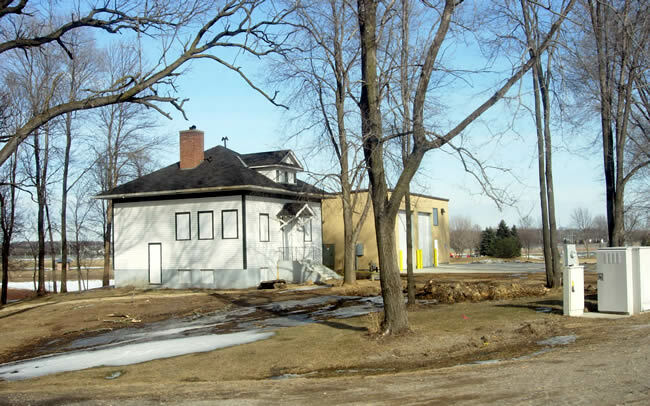 Note the old school house. Driving northwest on Rich Valley Blvd/Co Rd 71. A rather awful picture at the junction with Highway 3. The ramp on the right once served as US 52's link between Rich Valley Blvd and South Robert Trail. Highway 55 continued west towards Highway 149. Looking west across Highway 3 down County Road 71. 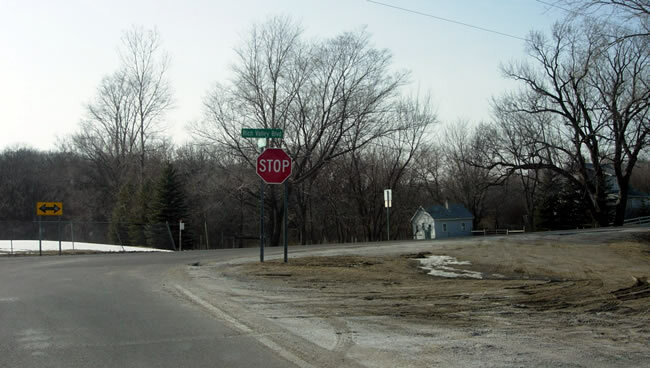 At the west end of County Road 71 and the junction with State Highway 149, site of the junction of Highway 55 with what was once State Highway 88. Looking northwest down Highway 149 from Rich Valley Blvd. 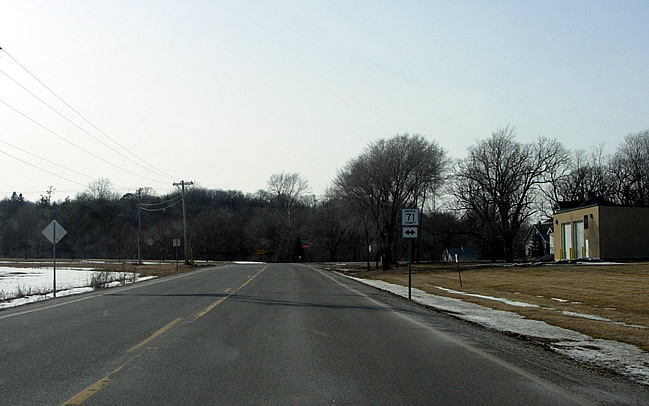 Highway 55 once traveled north on what is now Highway 149 to its current alignment towards the Mendota Bridge. 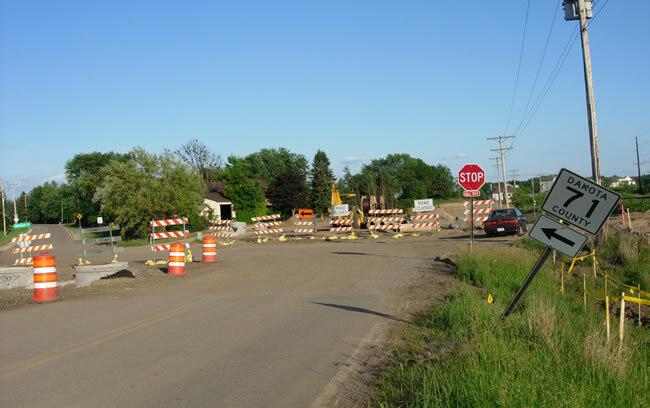 Since this photo was taken, Highway 149 has been fully reconstructed and expanded to four lanes through this stretch. Thomson West publishing headquarters is visible in the distance. The following three pics were taken in June of 2007 while I was checking out the reconstruction of Highway 149. 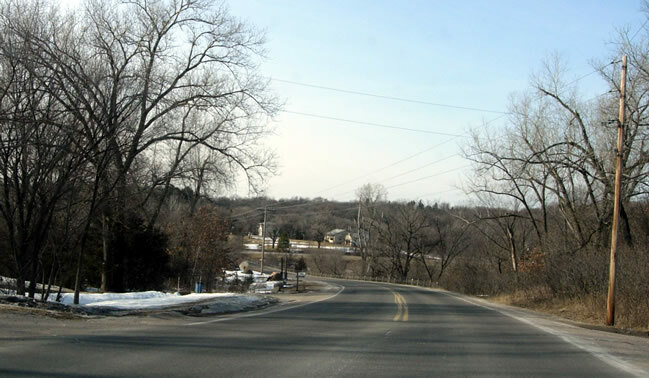 The junction of Highway 149 and County Road 71, looking southeast. Highway 149 was in the throes of its four-lane expansion at the time (note the askew junction sign). Looking southeast down Rich Valley Blvd. Driving southeast on Rich Valley Blvd on a summer's evening.